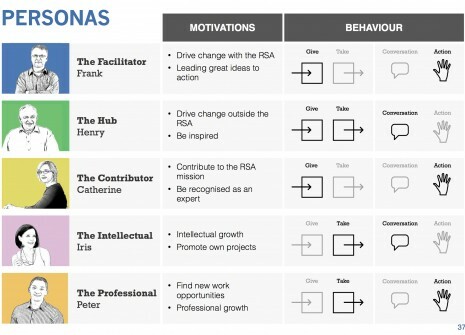 The RSA engaged Headshift to investigate the most significant characteristics and behaviours of their Fellows and Staff in relation to online and offline collaboration with, and among, RSA Fellows in order to inform the RSA’s emerging technology strategy. We worked using a user-centred design discovery approach, putting the capabilities and needs of end users at the centre of the process, and structured our engagement into three stages – data analysis, user interviews, and ethnographic research – providing easy-to-follow, actionable recommendations. Data analysis of the Fellowship survey helped us to build an initial picture of the factors affecting motivation and engagement of RSA’s Fellows and Staff, and the outputs of this phase included an activity map, touchpoint matrices, and user trends analysis. The user interviews had two main objectives to fulfil: firstly to understand the what, why and how of Staff-Fellow interactions, and secondly to surface goals, motivations and behaviours of a cross-section of RSA’s Fellows around their engagement and collaboration in the wider RSA. 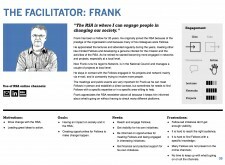 We presented our findings as user personae and journeys, communicating the needs and characteristics of RSA Fellows. Finally, we carried out a ‘day in the life’ study during two key Fellowship events, using a mixture of interviews and observation to understand real-life networking and the collaborative behaviour of users. This helped us to enrich our activity map and the touchpoint matrices, and created additional user journeys. The resulting overarching view gave us a deep understanding of RSA Fellow and Staff needs and current frustrations, guiding our recommendations for the technology strategy. Our recommendations focused on two dimensions, individual and group services, and discussed needs and appropriate solutions around profiles and people search, activity streams, homepages, project and network pages and network spaces, creating a holistic social environment, which complemented the offline interaction we had witnessed at the Fellowship event. The main focus was to organise information for Fellows at different levels (personal, project, RSA-wide, etc. ), to raise awareness around content and people, and help wider online collaboration across the RSA flourish in a sustainable way.